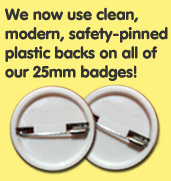 Wee Badgers aim to deliver you the badges you ordered, maintaining high customer satisfaction. 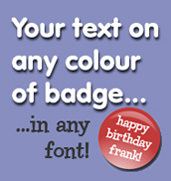 This is using a high quality JPEG of your design you will have provided, or using detailed text and colour instructions by email. If you require a proof of your design before it goes to print, please request this upon ordering. If you have given us instructions that have not met your requirements, we will do our best to rectify this by arranging the badges to be returned. Badges are shipped using Royal Mail 1st Class Recorded Post. Special Delivery is used to guarantee next day delivery if specified and additional fee is made. 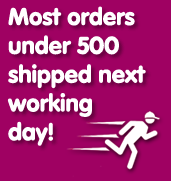 We use couriers if the quantity and weight of badges is large. We sadly can't accept responsibility for damaged, delayed or lost parcels, but will do our best to assist. There is no tracking for 1st class mail, and it's not guaranteed to be delivered the following day. If customers are concerned about their badge order, it is advised that you add the extra fee for Special Delivery for insurance. If an invoice arrangement has been set up, this must be paid within the specified 28 days. By uploading or emailing your designs to Wee Badgers you are confirming that you are the owner of the designs and have the permission of the copyright holder to reproduce any copyrighted material. Wee Badgers is not responsible for any injury or harm caused by badges.